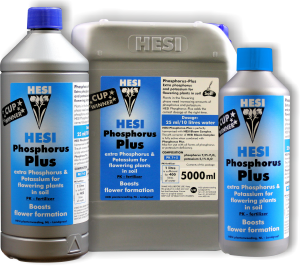 HESI Phosphorus Plus gives extra phosphorus and potassium to flowering and blooming plants. Flowering plants have a constantly growing need for phosphorus and potassium. With HESI Phosphorus Plus, the right amount of these is added at the right time. HESI Phosphorus Plus is also suitable for all forms of phosphorus or potassium deficiency. HESI Bloom Complex and its pH correction works well together with HESI Phosphorus Plus. Note: HESI Bloom Complex´s pH correction is also active together with Phosphorus Plus. It changes the pH value to slightly acidic, optimal for the plants.